I walked into the store the other day and to my delight I saw the most stunning display...boxes stacked floor to ceiling, overflowing with the most beautiful red peppers. The color was striking after this long colorless winter. It gave me the slightest hope that summer will be here soon. 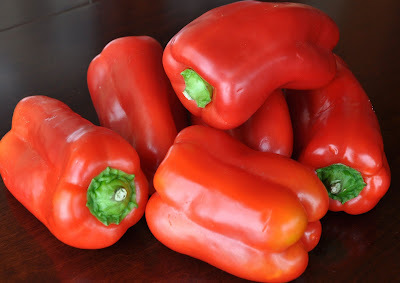 Now, I am not a huge pepper fan; I don't really like them raw, or added to pasta or other dishes, but I couldn't pass up buying a bundle. I thought I would try something different...roasted red pepper soup and was I surprised at how wonderful it was! 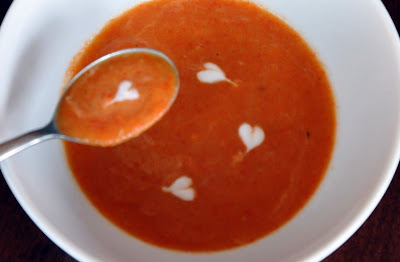 If you love tomato soup...you will absolutely love this soup. 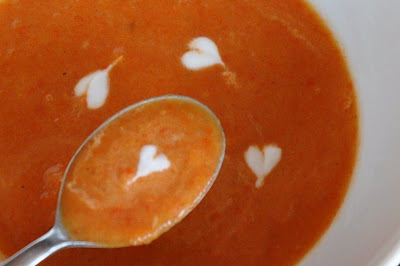 Add a few sour cream hearts and it would make a perfect soup for Valentine's Day Dinner. 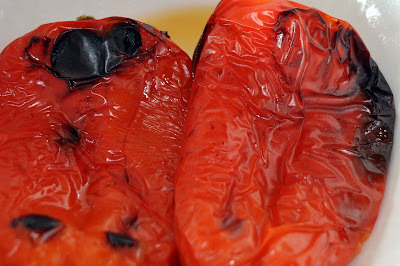 Preheat oven to 450 degrees F. Line a baking sheet with the peppers (use 2 sheets if necessary). 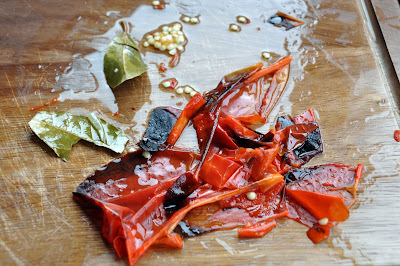 Roast the peppers for 20 minutes. Meanwhile, chop the shallots, melt the butter in a dutch oven or heavy pot, and saute the shallots on medium heat until translucent. 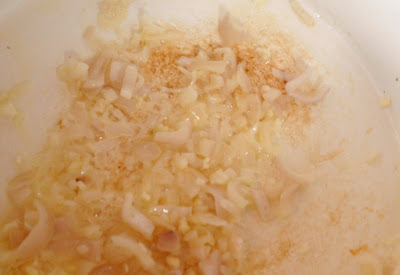 Use a garlic press to mince the garlic, add to dutch oven and saute for 1 minute (careful not to burn). 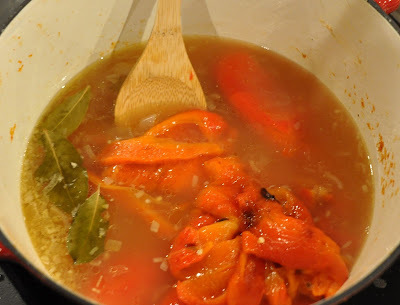 Add the chicken stock and bay leaves, cover, and let simmer on low heat. 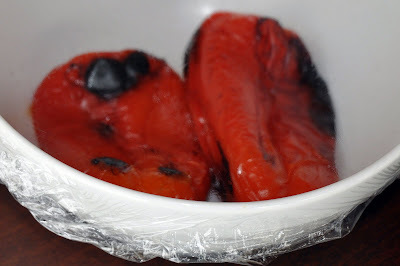 take them out of the oven and put them in a bowl and cover with plastic wrap so they can steam for 10 minutes. Or use more tin foil to make a pouch for them to steam in. 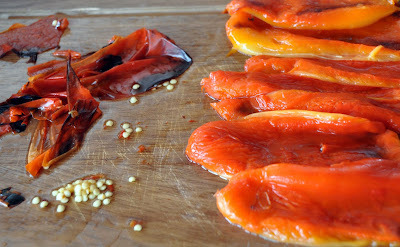 After 10 minutes, place the peppers on a large cutting board and let cool. Pull the stems out, peel the skin off the peppers, and take all the seeds out. Add the peppers to the soup and simmer for about 20 minutes. Remove the bay leaves from the soup. Am I crazy or is this the most beautiful mess. Use an immersion blender to blend everything together (or carefully use a blender to blend the soup). Season with salt and pepper. Add Cayenne pepper if you want a little heat. 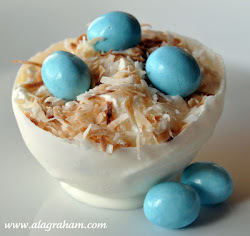 To make the hearts: add sour cream drops and drag a toothpick through the dot...voila...hearts! Hello, my friend. I love this soup! Love the hearts, too! 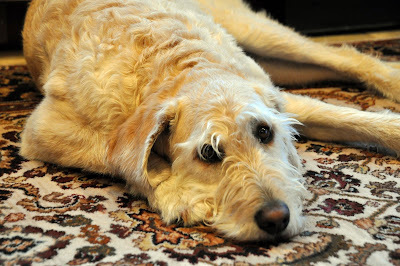 I'm going to TWEET your blog, because you so deserve to meet new blogger friends. I'm your #1 Fan! Oh Debby, you are the best and I am pretty sure you are my ONLY fan! Hee Hee!